Hiking for me started at an early age, as I was always an avid camper and Boy Scout. Living in the Catskill Region backpacking has become serious for me over the years. I camp, hike or multi-day backpack through the Catskill or Adirondack Wilderness every weekend. As a mid-weight packer I'm always prepared and use a tent for overnighters. Being an aspirant of the Catskill 3500 Club and Adirondack 46ers, peak-bagging is now my favorite outdoor activity. I will be climbing to mountain summits this winter equipped with snowshoes and crampons. My long-term goals are to complete long distance thru-hikes. * Above Other details taken from the product page on kershawknives.com. The Spec Bump is a folding pocket knife that features Kershaw's recurve blade, SpeedSafe assisted opening system and Stud Lock. As advertised from the Kershaw website the "Bump" series is a "High function with high style" knife. In my opinion thus far they have the high style right. The knife has a webbed texture and look on the handle. There is a pocket clip on one side with Kershaw engraved on it. On the top of the clip is another engraving with USA just below where it mounts to the knife. Just above the pocket clip looking at the knife horizontally, is the small screw that acts as the Stud Lock. Above that on the top of the handle is the Index Open feature. 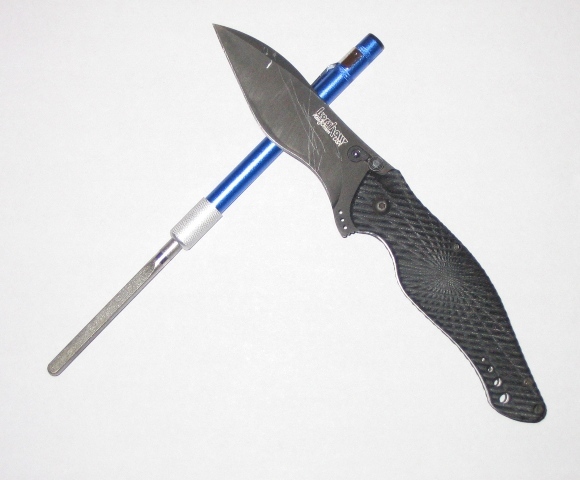 The blade is black and is stainless-steel with Tungsten DLC coating. It has a deep curve that makes up the bump in Spec Bump. On one side of the blade is printed the model number 1596, the kai patented logo and MADE IN USA. Below that to where the blade starts to indent toward the edge is printed S30V and behind that reads MAR 07. At the neck of the blade is the unlocking spring that is used to close the blade. I received the knife in a black vinyl and padded zippered pouch. 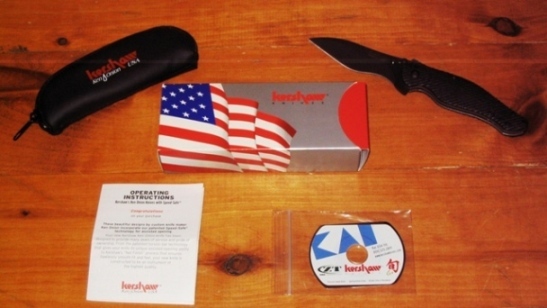 Along with that came the operating instructions and a small CD-ROM, containing three PDF catalogs of other Kershaw knife categories. The Spec Bump falls under their Utility/Police/Military category. On the back of the operating manual states the Limited Lifetime warranty. "Kershaw products are guaranteed for the lifetime of the original owner to be free of defects when received from the factory. Any product we find to be defective in its original material, construction, or workmanship will be repaired or replaced with the same item or one of equal value at no charge. (Of course, normal wear, abuse such as prying with the knife, or neglect are excluded from this non-transferable warranty.) For warranty service, please return product via UPS or insured mail. Include your name, address, telephone number, proof of purchase (sales slip), and a short explanation of the warranty service requested to the address below." The initial opening and closing of the knife was difficult. As I tried to follow the directions the safety or Stud Lock was not easily found. The operating instructions are designed for several models and have several pictures showing the opening and closing procedures. This made it confusing. As a Chef for many years in my past life, I was impressed to see that the blade had a more defined edge on one side. For example, when I rub my thumb lightly from left to right across the opposite of the blade, it is not nearly as sharp from right to left. With my experience handling chef knifes this method of sharpening works well when making those precision and precise cuts. I have also found with my experience that this method of sharpening saves the blade from being grinded down and losing its manufactured curve. Opening the knife for the first time was impressive as it had a smooth and accurate opening. It locked into place with exactness. It operated like the cocking of a well oiled rifle. It looked sleek in its opened and full length. After years of carrying a slimmer and lighter knife the Spec Bump at first feels a little bulky in my pocket. However, it is beginning to become a little more comfortable as I continue to wear it. The size of the Spec Bump is the only expectation that was deceiving from viewing it on the Kershaw website. I expected the knife to be smaller in its closed state. I carry a knife in my pocket every day. I will be sure to have the Spec Bump on my person each day of the test period, prepared to use it whenever the opportunity presents itself. During my trips to the back country my knife is used more than any other tool in my pack. During the testing period for the Kershaw Spec Bump, I will be taking several 2-3 day camping trips. Whilst on these trips I will be backpacking through the Catskill and Adirondack wilderness areas. On one of these trips I will be going to Mongaup Pond Campground in the Catskill Park. During this trip I will be working on my adopted trail segment doing maintenance for at least two full days. This trail maintenance will be on the Mongaup Hardenberg Trail to the first summit at an elevation of 2980 ft (911 m). I will also test the knife during a planned thru hike near the end of August on a segment of the Finger Lake Trail. The Finger Lake Trail is a portion of the North Country Trail that runs through the western part of New York State to the heart of the Catskill Mountains. As stated in my bio, I backpack, camp or take hikes about every weekend. The Kershaw Spec Bump will be tested on and during all my adventures during the test period. I will also use this knife as my everyday knife and carry it in my front pocket. Since I am in the shipping industry my every day knife is constantly being used to cut plastic bindings around cardboard boxes, opening packages and cutting cardboard. I also use my knife daily on my goat farm mostly cutting open hay bales and other farm related tasks. I carried the Kershaw Spec Bump Knife on a daily basis. It was used on my goat farm for cutting bailing twine and other miscellaneous farm duties. The knife was also used daily in my warehouse for many shipping, receiving and packaging tasks. Field testing in the backcountry took place at the following areas. At North/South Lake Campground for two nights in the northeastern region of the Catskill Park. The campground is at an elevation of 2100 ft (640 m) I hiked the North Point Loop to an elevation of 3000 ft (914 m). Weather was cool with temperature around 50 F (10.00 C) with heavy rain and thunder. I camped at the Russell Brook Campground for three nights at an elevation of 1300 ft (396 m) in the southern region of the Catskills. The weather conditions were beautiful, sunny with temperatures of 38 F (3.33 C) in the morning a high of 80 F (26.67 C) by mid-day. I hiked the Mud Pond/Trout Pond Loop from elevations of 1900 ft (579 m) to 2600 ft (792 m). This was a short hike with a round trip distance of 4.7 miles (7.57 km). Mongaup-Hardenburgh Trail from Mongaup Pond Campground to the first summit of Mongaup Mountain. This trip was for trail maintenance as a volunteer. Temperatures were around 70 F (21.11 C) with mostly sunny skies. The campground elevation is about 2200 ft (671 m) and 2989 ft (911 m) at the first summit. I camped at the campground for two nights. I trekked to the summit of Hunter Mountain located in the Catskills. The weather conditions were wet, cool and very slippery. It rained heavy at times and visibility was poor at times due to fog and low cloud cover. Round trip distance was 6.1 miles (9.82 km) with a summit elevation of 4040 ft (1231 m). Trailhead started at Notch Lake (Stony Clove) with a long very steep ascent and descent on the return. This mountain is probably the most hiked in the Catskills. Sugarloaf Mountain Loop with an added summit of Twin Mountain. Round trip distance was 9 miles (14.49 km). Weather was clear, cool and comfy with temperatures around 62 F (16.67 C). The first summit was Sugarloaf at an elevation of 3820 ft (1164 m) and the second summit was Twin with an elevation of 3640 F (1109 m). Trailhead started at Roaring Kill near Elka Park in the Catskills. Plateau Mountain from Notch Lake to the Mink Hollow Lean-to with a round trip distance of 8.5 miles (13.69 km). The summit was at an elevation of 3840 ft (1170 m). Weather conditions were warm temperatures with thick heavy clouds at times. There was a very steep ascend in the beginning. The mountain is located between Hunter Mountain and Sugarloaf Mountain in the Catskills. The Kershaw Spec Bump performed with precision when out in the field. After two months of consistent use the blade stayed sharp and is almost ready to be taken to a sharpening stone. The sharpening process will be accessed during the Long Term Report of this review. On my farm the knife was always reliable. It cut hay bailing twine with ease and opened feed bags like butter. I used it to splice wiring and cut rubber and plastic insulation for my electric fencing. The Spec Bump was used to shave down the ends of thick tree branches to be used as posts. These branches measured to be about 3 in (7.6 cm) in diameter and I whittled one end to an almost point. The pointed ends acted as a spike and the branch was converted into a post for the electric fence. In the warehouse, where the knife was used most, the Spec Bump executed all cutting jobs with superior performance. The knife was used to open boxes sealed with packing tape and to cut plastic banding around shipments and bundles of warehouse supplies. For example, the plastic bands that I am referring to are the ones you see around news paper bundles before they are displayed and sold. Some of these bands were up to 1 in (0.03 m) wide. The knife was used to cut away thick plastic shrink wrap from freight deliveries which is used to hold many packages together on a pallet. I did use the knife to cut cardboard on only a few occasions. I tried to avoid this since cutting cardboard with any blade can accelerate a dull edge. After about the first two weeks of using the knife I did have a temporary issue with the safety lock. The lock was stuck in the unlock position and I couldn't slide it with my fingers. I used a small flat headed screw driver to push the safety lock to the locked position and then back to unlocked. I repeated this process about three times and it began to loosen. A few days later the safety lock was back to normal and sliding with a slight push of the thumb. Back at the camp locations when out in the backcountry the knife was used to cut different gauged ropes and cordage. I whittled away with the knife making items like lantern posts from dead branches and marshmallow sticks. I designed marshmallow sticks faster than any girl scout with the makings of S'mores. All thanks to Kershaw's Spec Bump. The only complaint I have about the knife is about its weight. It is a little heavy and slightly bulky. It is almost a little too heavy for a pocket knife. Aside from that the knife is great and operates like it's still new. The opening process with the Index Open feature is still smooth and accurate. I find myself opening and closing it over and over. It's just so fast and precise as it whips and locks into position. My dad, who loves knives and always carries one, fell in love when he opened it for himself. Kershaw has definitely perfected their art in knife design. I will continue testing the Kershaw Spec Bump for the next two months for the Long-Term Report period. I will have a more accurate perspective of the knife with the continued use. The knife will remain on my person during all my outdoor adventures. The Bump will receive consistent use in my warehouse during work hours and also out on the farm with its daily chores. I will perform any other tests to explain its quality for this final testing period. I will evaluate the knife and report on its performance over the entire four month test period. This concludes my Field Report. The Long Term Report should be completed by 01-08-2008. Please check back then for further information. Besides carrying and using the knife in the backcountry it was also used daily for many tasks on my goat farm and in my warehouse. Below are the backcountry locations where the knife was carried or used. The following three mountains are located in the Blackhead Range in the Northern Catskills. Black Dome Mountain - This was a short but strenuous hike to the summit of Black Dome. The weather, not surprisingly changed from beautiful sunny skies at the trailhead to cool, rainy temperatures on the summit. On this 5 mile (8.05 km) out and back hike the temps went from about 60 F (15.56 C) down to a cool, damp 50 F (10.00 C). There was an elevation change of 1780 ft (543 m). The elevation on the summit was 3980 ft (1214 m). Blackhead Mountain - This was a strenuous 4.5 mile (7.3 km) loop hike with an elevation change of 1740 ft (531 m). The summit elevation was at 3940 ft (1201 m). Weather was a beautiful fall 60 F (15.56 C) day. No complaints with the conditions on this day. Thomas Cole Mountain - Also known as Camels Hump. This moderate 5 mile (8.1 km) hike offered great views being that all the leaves at this time were on the ground. Came to some ice sheets on the trail, but was able to skirt around them without crampons. This was a brisk sunny day with high temperatures around 40 F (4.44 C). The low temperature at the trailhead before first light was around 20 F (-6.66 C). The highest elevation point on the Camels Hump was 3525 ft (1075 m). The elevation on the summit of Thomas Cole was at 3940 ft (1201 m). Indian Head Mountain Loop - The 7 mile (11.27 km) trek was challenging with almost vertical ascents up two cliffs. The summit elevation was at 3573ft (1089 m). Temperature was 20 F (-6.66 C) at the starting trailhead with many sections of trail covered with thick ice. Crampons were needed for most of the day. Giant Ledge and Panther Mountain - This 7 mile hike climbed to two summits with an elevation of 3200 ft (975 m) on Giant Ledge and 3720 ft (1134 m) on Panther Mountain. There were heavy snow conditions with temperatures around 20 F (-6.66 C). On Panther Mountain was about 2 ft (61 cm) of accumulated snow with deep powdery snow drifts that made the ascent a bit more challenging. The Kershaw Spec Bump knife performed well with quality and perfection during the entire test period. I continued to use the knife daily for various duties on my goat farm. I also used it in my warehouse for many shipping and receiving tasks. I did have to sharpen the knife once and it didn't take much to get the blade back to a sharp edge. Using a diamond sharpening rod only a few draws of the blade on each side is all it took. Below you can see the sharpening rod used. Before I sharpened the knife it was pretty dull from the daily usage it did receive. Compared to other knives I own the sharp edge on the Spec Bump did last a bit longer. This may have something to do with the design edge of the blade. As I described the edge in the initial review it has the defined edge on one side. Once sharp again I was able to cut various sized cordage and thick ropes. The knife came in handy when winterizing my boat. It cut through rope with ease and went through the plastic wrap like softened butter. On the farm I continued to cut open hay bales with no issues. The baling twine took no pressure at all to cut through. I find it amusing to cut them at times when the pop open. Sometimes the twine is under pressure and when I brush the blade by them they bust open and pop like releasing a cork from a champagne bottle. In the warehouse the knife was used for the same tasks such as opening shipping cartons, packing tape and breaking down loaded pallets. I have not experience any issues with the knife while performing any of these tasks. While out on the trail I did however find the knife a bit heavy. Most of the weight comes from the heavy duty handle but it does add to knife's quality and longevity. Another issue I found was the metal handle makes for a very cold hand when using without gloves during winter weather. The Kershaw Spec Bump is a high quality knife that performed with precision and perfection. From the impressive index open feature to the innovative re-curve blade this knife gets all jobs done efficiently. I have yet to own another knife that can meet or beat the Spec Bump's performance. I will continue to carry the Spec Bump and use it daily. The knife will remain as my most used tool on the farm and in the warehouse. However, I will go back to using my other smaller knife for my backpacking trips to shed a little weight. My other knife also has a plastic handle that will help with handling it on cold days in the wilderness.